We have shared a Porch Glider Plan in the past, but a variation on the theme is always in order. Everyone has a slightly different aesthetic and, even though the methods are essentially the same, seeing a design that suits your style is much more likely to get you to start building. 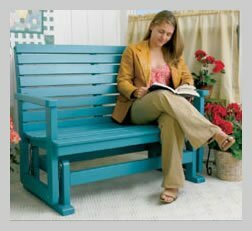 The following porch glider is a classic design that leaves much room for modification. Some simple lengthening, or shortening, of pieces will allow you to adjust the width to suit your exact needs. This free plan comes from The Handyman Club. This is a good website for any woodworker. 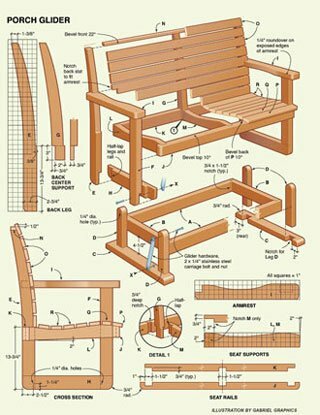 Good luck building your own porch glider. You can purchase the porch glider bracket set at Rockler for around $30. I have a glider similar to this that needs fixing. The bench leans to one side and the rear leg on that side rocks. I would like suggestions on how to fix it. Could you send some photos? Send to [email protected]. Kind of hard to visualize the issue. Still can’t find a photo of the image where I can read the measurements? Any help? You are in luck. I was able to locate the original plan and everything is perfectly clear. Uploading in the next 20 minutes. I’ll send you another note when available. All set. The links are now updated with the full plan with clear dimensions. Good luck! I downloaded the Porch Glider Project Plan. I really like the project, but I find the drawing is too small to be useable. The curse of getting older. Is it possible to get a larger version of the drawing? I am sorry, bu the handyman club of america no longer appears to have the source image. I did a local search and also a search using the internet archive and an image matching search online. None of them came up with anything larger. Really? I gave it a try, and the article came right up. Complete with and 8×10 of the graphic. link the website that has this? Unfortunately, it looks like Handyman Club took the plan down. I did have an old Printout of the plan from their site and updated the link to that. It is a PDF and you can’t scale the images up, but it should help you get through the build. Just the material list and cut list should be a big help. Just go to their site and do a search for “porch glider.” I got a 5 page print out of the article. Complete with full size graphic. You might have to do a search for the site. I don’t think it used the obvious name.